Solid-state lighting based on light emitting diode (LED) technology has the potential to provide superior lighting services to low income people in off-grid areas of developing countries, many of whom currently rely on fuel based lighting sources such as kerosene. If this potential is to be achieved in the near term, however, manufacturers must produce off-grid lighting products that are inexpensive, perform well, and meet the needs of potential end users. At present, relatively few products meet all three of these goals (e.g., see Mills and Jacobson, 2008). 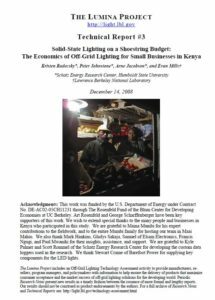 In this article, we report results from a detailed study of lighting use by micro-enterprises in two small towns in Kenya’s Rift Valley Province. The work included a survey about lighting use by 50 small businesses, careful measurements of kerosene lighting use patterns and associated costs for 23 of these businesses, and a subsequent field trial in which 14 of the 23 businesses purchased and used low cost LED lamps over a number of months. See Figure 1 for an image that shows a micro-enterprise that uses fuel based lighting during evening time business operations. A central goal of the work is to increase awareness on the part of manufacturers, policy makers, and other interested groups about the lighting needs, economics, and preferences of microenterprises in places like Kenya, as this group has potential to act as early adopters of off-grid lighting products based on LED technology. The findings are also intended to inform manufacturers about key linkages between product design choices and the affordability of these products for small businesses in places like Kenya.